In this blog post we will be looking at a number of free to use festive plugins for use with your WordPress site. As with all WordPress plugins, we recommend that you have a backup of your site before adding them, just in case anything goes wrong! This plugin adds a widget that you can drop into the sidebar of your site, that displays a jolly Santa Claus and a countdown to Christmas day. The countdown timer appears on a transparent background, so it can integrate into your theme without breaking the style. The plugin was recently updated so there’s unlikely to be any compatibility issues. There are currently over 1,000 installs and no bad reviews, which is rare for a WordPress plugin! Find out more on the Christmas Countdown Widget page. This simple plugin adds a snow effect to the top of your site. It requires no configuration, just install then activate it in your plugins area. Xmas Snow has no negative reviews, and compatible with the current version of WordPress. Find out more on the Xmas Snow page. Another snow effect plugin, this one displays falling snow flakes on your homepage. Tribulant Snow Storm has settings that allow you to customize the color and amount of snow, as well as allowing you to define if the snow sticks at the bottom of the screen. The plugin also has responsive and mobile support. Find out more on the Tribulant Snow Storm page. The Xmas Lights plugin adds a string of festive Christmas tree lights that twinkle and animate to the top of your site. The plugin is simple to install and requires no configuration. Find out more on the Xmas Lights page. This plugin makes a soft version of Jingle Bells play in the background. Drive visitors to your site mad trying to find where the music is coming from! You can configure Christmas Music to only play on certain pages or posts, and you can add pause / play buttons to the corner of your page. Find out more on the Christmas Music page. 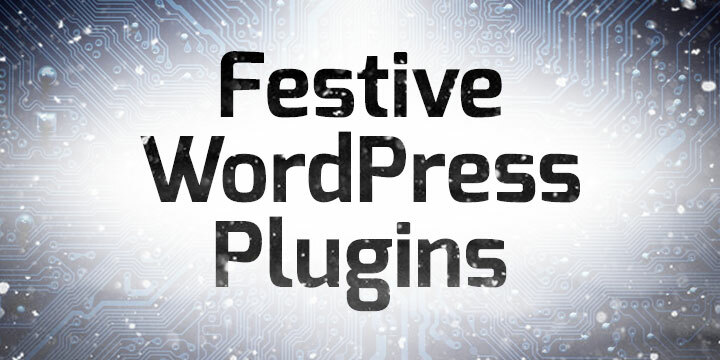 This is a just a handful of the festively themed plugins that are available for WordPress, and we recommend checking out the complete list in the WordPress plugin directory. Check out our WordPress Hosting package, and keep a look out for our Twelve Days of Christmas promotions, which will be starting on Tuesday 13th December!